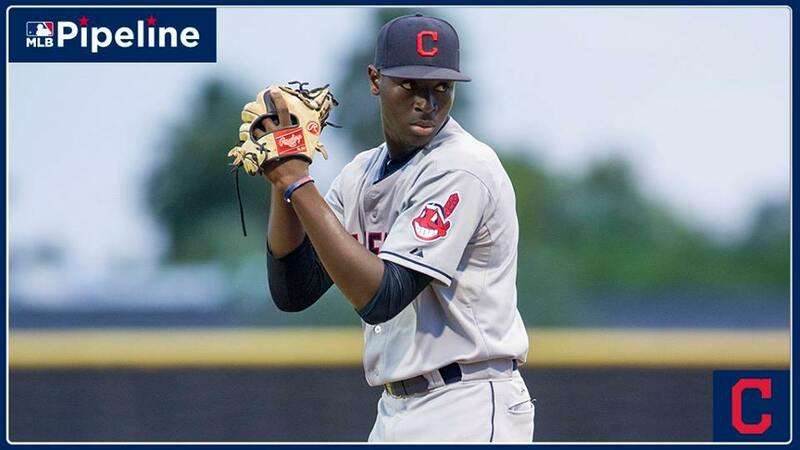 Indians Tahnaj Thomas Top Prospect, the pitcher at 19 years old, is standing 6′ 4″ and 208 lbs and is loving his new position. As a result of moving from Grand Bahama to Nassau, Bahamas. Tahnaj Enrolled in Leadership Academy and Maximum Development baseball program (MaxD). Eventually playing in the Freedom Farm Baseball League, a top youth sporting organization in the Bahamas. Joining Thomas also at MaxD were Lucius Fox Jr, Jasrado Chisholm, and Larry Alcime Jr, all who went on to play Pro Baseball. Hence as Tahnaj started to grow from a 13-year-old 6ft 160lbs kid to the 6.4ft 208lbs young man; And so did his baseball skills. Along with his league play, and his working out with some other talented young baseball players, the 6 foot plus shortstop was blending right in. Other players dreaded when Tahnaj was called on to close a game; it wasn’t pretty for the hitter. After watching three of his fellow MaxD players signed to minor league baseball teams, he knew one day his time would come. 2016 Andre Rodgers Bahamas National Baseball Championship in Freeport Grand Bahama. A display of good defense and offense by the Freedom Farm 18U Baseball team caught the eyes of all the baseball scouts at the Nationals. Tahnaj asks the coach to pitch an inning on the mound at the Nationals, and oh boy all the radar guns were out as he warmed up. And the fireballer did not disappoint. Throwing lights out to the fans delight. Later the next day at the Nationals, the Reds scout asked? Coach! Can I see Tahnaj Thomas throw the baseball today, please? Subsequently, the coach did not let him pitch. Six foot plus and growing, the talk about a position change for the shortstop/third baseman began. Therefore more and more baseball scouts started asking to see Tahnaj throw the baseball from the mound. And so with each showcase, Tahnaj started gaining confidence in throwing the baseball from the mound. And that was the move most scouts were hoping to see. As a result, Tahnaj got invited to more baseball showcases. A four days showcase in Panama was cut short, and Tahnaj had to be flown back home because his mother was very ill; His number one fan. Tahnaj Thomas mother was battling cancer for a while. Tahnaj made it back home just in time before she took her last breath. Thus a tough time for Tahnaj, the pain of losing a mother. But the help of Family and friends should go along way in helping ease the pain a little. But there is nothing like a mother’s love; Time will have to do the real healing along with trusting God in the process. On December 5th, 2016 the Indians signed Tahnaj Thomas to pitch in their minor league system, turning the infielder into a pitcher. Thomas reported to the Indians pitchers camp in January 2016 to work on his pitching in Arizona. The Indians has started to work on their newly founded raw pitching talent. Starting his baseball career in the Dominican Summer League, Tahnaj played his first three-games for The DSL Indians. Before returning to the Arizona League where he pitched in thirteen games and started in ten of those games for The AZL Indians. The Indians was able to get Tahnaj into 16 games in his first season; That saw him started 13 of those games. Finishing with a 5.63 earn run average, in 38.1 innings pitched and 34 strikeouts. The Indians add a team in the Arizona League, and Tahnaj went to the AZL Indians team1, where he started six of the eight-game played. For a 4.58 earn run average, 19.2 innings and 27 strikeouts. Tahnaj Thomas was learning his new position as a pitcher, throwing the baseball at 92-94 MPH. And Tahnaj Thomas moved into #30 on the Indians Top 30 Prospects list. He was able to hit 97 mph with his fastball also this year. Tahnaj Thomas & Chavez Young Elite 9 Baseball Classic. In the meantime, Tahnaj Thomas with Chavez Young and other minor leaguers will be hosting The Elite 9 Baseball Classic on December 26-29, 2018 in memory of Tahnaj’s Mother Mrs. Michelle Thomas. Hence Tahnaj Thomas continues his support for a cure for Breast Cancer. He also has to keep his mother’s hope alive of him being a Major Leaguer. Finally, He is looking forward to the 2019 season. Whiles looking forward to supporting 2019 Don’t Blink 242 Home Run Derby in Paradise. See you all at the Don’t Blink 242 Home Run Derby in Nassau, the Bahamas. Jeffrey was born on April 29th, 1961, in Nassau, Bahamas to Rejoiner Ann Rolle and Jerome James Francis Etienne. Married to Andrea G. Rolle-Francis, they have two daughters; Janae Latoya Francis, a graduate of Allegany College of Maryland, and Jessica Lee Francis a graduate Potomac State College West Virginia University in Kyser West Virginia. Jeffrey was coaching the sport of baseball from 1980 at the age of 18 years old because he loved the sport as a kid. He started listening to the game over the radio out of Miami Florida in the late 60s and in the early 70s started playing the game locally in various local leagues right up to the premier senior league; a league where all of the current Bahamian minor leaguers played. In 1982, Jeffrey had an invite to a three day tryout with the New York Yankees in Hollywood Florida, which was an awesome experience that is lasting a life time memory for him. Jeffrey has been following the Bahamian baseball players in the minor leagues since 1999 with Angelo Burrows, but found greater interest with the signing of Antoan Richardson in 2005. He also writes a year end review on their play on his Facebook page, Baseball Bahamas, and he has a website with the same name. He has a great following and would love to expose the baseball players to a bigger worldwide audience. He has a good relationship with all the players because he personally coached most of them. His favorite MLB Team is the Detroit Tigers from 1969.